We are a leading RYA Sailing School in the UK, offering the full RYA Sailing School syllabus. Launched in 1994, we have 25 years’ experience in delivering the RYA Sailing School programme from Start Yachting through to Yachtmaster Offshore. Firstly, we are passionate about delivering excellence in RYA Sailing School training and ensure an enjoyable and memorable experience for all. From your first contact we will ensure a smooth and friendly service; getting you booked in, provide essential pre-course information and a warm welcome on arrival. Once on the water we pride ourselves on developing boat handling, navigation and piloting skills whilst building your confidence during your RYA Sailing School course. Whether your goal is to become a competent crew member or skipper your own boat and crew, we deliver the full RYA Sailing School programme in a safe and fun filled environment. Secondly, you will be learning to sail in the UK’s only coastal National Park. You will be gaining your RYA certificates whilst experiencing spectacular scenery and wildlife. 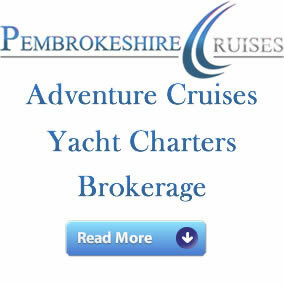 Our RYA Sailing School cruising grounds cover the uncrowded Pembrokeshire National Park coastline, the Nature Reserve Islands and the 24 miles of the Milford Haven waterways. We are great believers in our students having a full cruising experience, living on board and enjoying all meals together. We prepare breakfast, lunch and supper on board, eliminating the pressure of finding and paying for a marina and restaurant every evening. Thirdly, our RYA Sailing School base in Neyland has 24/7 access to the Milford Haven waterways, and the diversity in scenery and wildlife takes second place compared to sailing conditions it offers. We have the World’s second largest tidal range, and every possible navigational mark, bar one. There is both commercial and leisure craft on the Haven, together with tranquil stretches of coast abundant with anchorages and hidden coves. We sail both in open sea and the sheltered waters of the estuary, so whatever the weather you will get a full RYA Sailing School experience in a perfect environment for Sail Training. It is said that if you can sail Pembrokeshire, you can sail anywhere! But don’t just take our word for it. Please read the latest comments from our RYA Sailing School students in our Testimonial section. 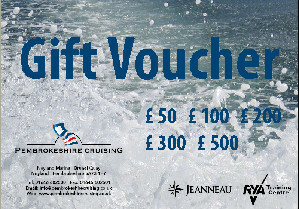 Our gift vouchers can be for any amount and can be used towards any of our RYA Sailing Schools. 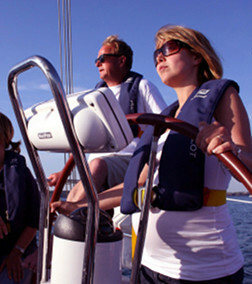 So get your family and friends a voucher for one of our RYA Sailing School courses.